(Photo: REUTERS / Carlos Garcia Rawlins)Venezuela's President Nicolas Maduro attends to a meeting with representatives of the opposition, the Roman Catholic Church and Union of South American Nations' (UNASUR) at Miraflores Palace in Caracas April 10, 2014. Maduro hosted Venezuelan opposition leaders on Thursday at the start of mediated talks intended to stem two months of political unrest that has killed dozens in the OPEC nation. 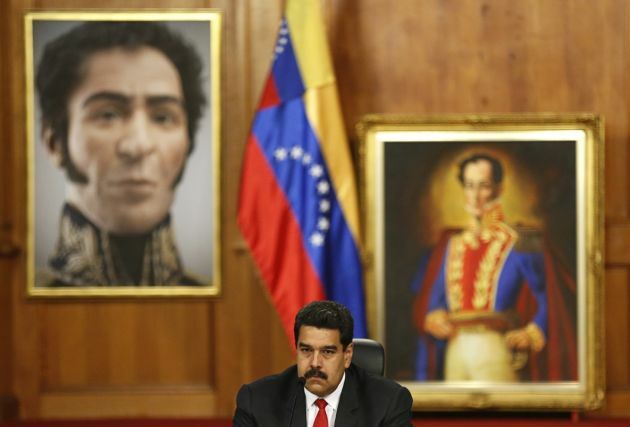 CARACAS, April 10 (Reuters) - Venezuelan President Nicolas Maduro this week cautioned opposition leaders to keep their expectations modest as he hosted them for mediated talks intended to stem two months of deadly political unrest. What would Hugo Chávez think of Pope Francis? Maduro has held similar meetings previously but this was the first to include Henrique Capriles, who Maduro narrowly beat in last year's presidential election, and the first to be brokered by foreign ministers from the Unasur bloc of South American governments. The six-hour meeting Thursday coincided with violence that raised the death toll from the protests against Maduro's rule to 41, and Capriles warned the unrest would escalate in the absence of political reforms. "The road here was long and complicated, but it was worth it," Maduro said earlier in lengthy opening comments. He cautioned against unrealistic expectations. "There are no negotiations here. No pacts. All we're looking for is a model of peaceful coexistence, of mutual tolerance." On Thursday the Vatican's envoy to Venezuela read a letter from Pope Francis who said the talks were the only path to peace. "It's a long and difficult road, which requires patience and courage, but it's the only one that can bring peace and justice," the pope said, according to a copy of the letter distributed by the Vatican on Friday. "For the good of the entire population and the future of your children, I ask you to have this courage." Both sides are due to meet again on Tuesday. They have both asked the Roman Catholic Church to be a "good faith" witness. Pollsters say approval levels for both Maduro and the opposition have fallen during the crisis, while an already slowing economy has suffered a further drag from the impact of violent clashes on businesses and transport. Dozens of anti-Maduro demonstrators remain in jail and some hardline opposition groups, including the party of jailed protest leader Leopoldo Lopez, boycotted the talks, which took place at the Miraflores presidential palace in Caracas and were broadcast live on every TV channel. Authorities said on Thursday a policeman was shot dead during a protest in western Barquisimeto city, and opposition activists said a woman died in hospital almost a month after being hit by a car while demonstrating in central Valencia. Those fatalities brought the death toll to 41. About 650 people have been injured since the protests broke out in early February, officials say, and more than 2,000 people have been detained. Of them, more than 170 are still behind bars. Capriles, defeated in last year's election to replace late socialist leader Hugo Chavez, was one of the last to speak, well after midnight. He told the foreign ministers of Brazil, Colombia and Ecuador that Venezuela was crippled by violence, economic misery and political polarization. "We don't want a coup d'etat. We don't want an explosion on the streets," Capriles said. "Either this situation changes, or it bursts. I hope it changes because I don't want violence." The volatile political atmosphere was illustrated in the reactions of National Assembly boss Diosdado Cabello who, sitting across the table from Capriles, described him as "the fascist assassin" on his Twitter account. "He doesn't understand he lost the election in April (2013). It looks like he's missing something," Cabello also tweeted. Maduro, who calls himself the "son" of Chavez and is seeking to preserve the OPEC state's popular oil-funded welfare policies while tinkering with his predecessor's statist economic model, said ahead of the meeting that he would talk but not negotiate. He would be a "traitor," he added, if he began negotiating away the gains of Chavez's revolution. Hardline protesters have openly sought to provoke a "Venezuelan Spring" that would force him from office, but failed to bring the millions onto the streets they hoped for. The demonstrators have proved persistent, however, with sporadic roadblocks, marches and other protest tactics in some cities. Maduro says that if the opposition wants to get rid of him, it would have to be via the ballot only. His foes could force a presidential "recall referendum" in 2016 if they garner about 4 million signatures for it. Maduro's six-year term ends in 2019. Venezuelans across the political spectrum are fed up with violent crime and economic problems including an annual inflation rate that is pushing 60 percent and shortages of basic products from milk and flour to toilet-paper and car batteries. Liborio Guarulla, the opposition governor of southern Amazonas state, told the meeting people should not think the start of talks would solve problems overnight. "We won't make miracles with this. The economy won't improve by tomorrow," he said. "But we are building something."